Every Epic Camp is different. Different athletes, motivations and objectives; on a personal level I’ve approached each at differing levels of fitness. They are always challenging, but it’s up to each athlete to make the most of them. Points provide some incentive, camp completion another; how you survive is your choice, it can be as easy or hard as you make it. There’s little mercy, the pack can be ruthless, but you chose to be there. I have never experienced a training environment quite like them. Sadly at the closing dinner Scott confirmed his retirement from Epic Camp. The format may return, but he’s done. The fact it was the final camp had persuaded me to come along. Epic Camps have been a huge part of my development, the athlete that arrived in Lyon last week was very different to the one that arrived in Verona three years before. Epic Camp Italy was my first and opened my eyes to how hard you could really push yourself and how deep you could dig. There are hundreds of miles of training since that camp in the Dolomites. I’ve pushed myself, always looking for more, though not often finding it. Were I honest I was often frustrated by the lack of progress and the sense I was stuck on a plateau. I’d write about taking next steps, but fear that I’d found my level. My only response was to keep working. Were I really honest, I look back and see many mistakes. This year is different. It has its problems, but feels like the training is finally returning results. I rode hard in the Alps. I pulled the bunch along not for points, but because I could and it would do me good. I was strong, even at my lowest I’d get through the day. Wearing the Green Jersey had been a goal, but reading Scott’s observation was a bigger reward. It’s gratifying knowing he can see the change, the results of patience and hard work. I briefly want to reflect on an amazing finale to Epic Camp. Every aspect came together – the environment, the mix of athletes, even the weather turned out. Day after day riding through stunning mountains as the thermometer rose above thirty degrees. Perfect. Good company, it was great to be riding with John, Scott, Douglas, Steven, Randy and Clas again; and new guys in the mix like Zach and Rob Palmer helped push us along. Steven may have rapidly locked up Yellow, but the competition for the Polka Dot Jersey went to the line. Rob Palmer was a well deserved winner of Green, he grew in strength and confidence over the week; that’s hard. The riding was incredible. 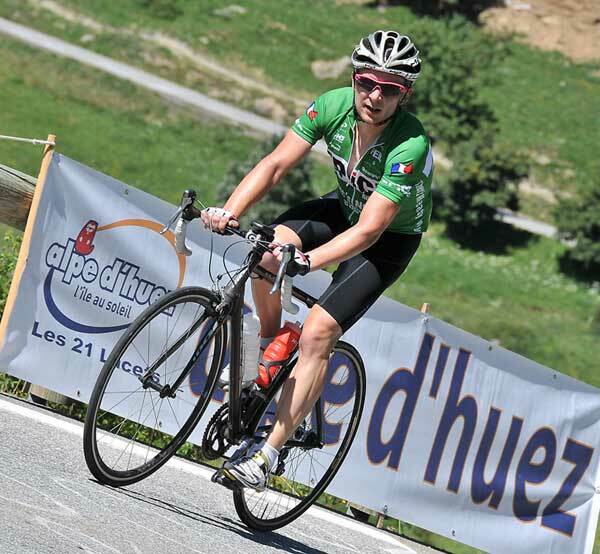 I have spent a lot of time in the Pyrenees, but the Alps were an amazing venue and the choice of Cols superb. Days were immensely challenging, the only easy cycling was the descents. My highlight was the Alpe D’Huez day, not for the famous climb, but the unplanned breakaway on the return. I moved to the front, accidentally gapping the bunch, Steven suggested we go for it; thirty kilometres to secure King of the Mountain points on the Col du Lauterat. That was hard. Driving a hard pace to start left me hanging in and struggling to do useful turns, but it worked – Clas and Steven took first and second on that Col. Racing the Embrunman standard course was a huge high too. I think most of us would admit we weren’t too enthused on the morning of the race, but the course is perfect. I struggled with the descents, but finding I could push myself that hard in a camp was a good experience; particularly managing to run well after so much time away from training. I’d like to race the full Embrunman, though having ridden the Col d’Izoard I’ve no illusions about how tough that will be. It’s hard to capture eight days of Epic Camp in a blog, so many highs and lows in a single week. I’ve come away with increased confidence and enthusiasm even if right now all I want to do is sleep! Huge thanks have to go to Scott Molina and John Newsom for organising the camp. And none of it would be possible without the hard work of the support crew – Ian and Julie of Pyrenees Multisport and Anna for massage. Now I recover, hope my body can put itself back together and even race again in September. I’ll post some data from the Camp later this week – power files and overall numbers. You can find all the rides on my Strava account as well. I recommend you check out the other Epic Camp blogs and pictures for other perspectives on the Alps. With no more Epic Camp, I’ll have to look elsewhere to get my training kicks next year.